We will ensure your special day is unforgettable! 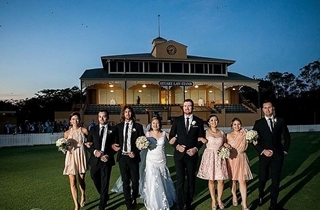 The Pavilion Function Centre, one of Brisbane's premier sporting venues, presents a unique opportunity to host your event. Imagine hosting pre-dinner drinks overlooking the oval where champions have played, or cocktails in our newly renovated outdoor function space. The Pavilion Function Centre has beautifully appointed function rooms, all featuring floor to ceiling windows overlooking the field. Our event managers have extensive experience in both coordinating and managing your event from your first phone call to the departure of your last guest. Our philosophy is simple: understand the needs of the occasion then tailor a package to suit, ensuring every detail is met with precision. Our talented Executive Chef and his team have produced a range of contemporary and innovative menus certain to satisfy. We understand the importance of food. Our dishes are styled, designed and priced to compliment your special occasion. Our food is of the highest quality, representing the finest of fresh ingredients combined with culinary passion, complimenting any occasion. We take pride in providing detailed assistance in the planning of every facet of your event; a complete package can be tailored to suit your special occasion. The Captains' Room is a large pillar-less room that has floor to ceiling windows overlooking the beautiful green playing field and gardens. The room features state-of-the-art audio-visual facilities, a private bar and lift, a deck with views of the field, private bathrooms and entrance. Pre-dinner drinks and canapes can be held downstairs in The Picket Fence Cafe and private courtyard. This sheltered area is nestled under a beautiful 100 year old poinciana tree covered in fairy lights. It is set with an array of quality jarrah furniture, high bars, stools, benches, lanterns and candles which enhance the sense of romance. The bride and groom also have access to a private bridal room, where they can freshen up and enjoy private drinks with their bridal party before the formalities begin. The Century Room is perfect for smaller receptions with a floor to ceiling glass wall giving views of the gardens' emerald green fields, as well as a large deck. The room features a huge, open deck with lovely panoramic views, creating the perfect atmosphere for pre-dinner drinks. Or you can choose the private Century room's garden courtyard that opens out onto the lawn overlooking the field and white picket fence, creating a beautiful garden-party feel. High quality Jarrah furniture, high bars, stools, benches, lanterns and candles. The Century Room also boasts modern facilities, private lift, private bathrooms inc disabled facilities, a private bar and entry foyer.